Let’s face it, when you live in a place like Boca Raton, it can be challenging to have soft, straight and sleek hair. We deal with blazing hot heat, humidity and of course the salty air. South Floridians know the only way to having smooth, strong hair is to treat the hair with a straightening method built to last. We’re going to get you on the fast track to the essentials. Here’s what you need to know when considering using this type of treatment Salon Sora style. 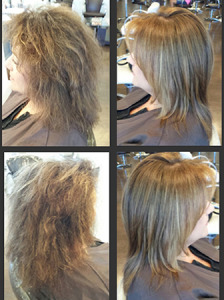 Keratin treatment is a temporary fix that will help to eliminate the frizz, the funk and the unruly! Rather than using damaging flat irons to straighten your hair, Brazilian Keratin Treatment or BKT, allows you to achieve the same look without the maintenance. If you sound like a you fit this profile, then we suggest speaking to a professional stylist. This is a highly complex process, that needs to be handled by someone who is knowledgeable and skilled. Otherwise, you could be looking at some serious damage. Applying the treatment will require anywhere from 1-5 hours depending on the length of your hair and how well the product takes. (Note that not all hair is equal). This therapy should be done 3-4 times per year. If it’s done quarterly, you’ll notice there will be less breakage and your hair will grow faster and who doesn’t want that? Nonetheless, expect to become very good friends with your stylist, as this is not a rushed job. It’s important to remember not to wash, or let hair get wet for up to 3 days after your first application. Reason being, it takes time for the chemicals to seep deep into the hair to work properly. After the waiting period use a shampoo and conditioner that don’t contain sodium chloride. Your hairdresser will explain what products are best for BKT treated hair. Another thing to note: If you wear ponytails, rubber bands, hair clips, head bands or any other hair apparatus, put them away until your first shampoo. By using these items can shape the hair and make permanent band marks, so take precaution here. This is a delicate procedure that should be handled by a professional to avoid damaging the hair. After you’ve achieved the look you desire, maintenance is simple. Just think of how happy you’ll be having more time enjoying your life, rather than styling your doo every morning! For a BKT consultation, contact our receptionist.